By far the most complex stadium in Russia but also the most controversial one financially. Zenit Arena just got more complicated as overrun of 5 billion rubles is revealed. Popular Russian website Fontanka decided to analyse all of the financial documentation of the Krestovsky Ostrov stadium, nicknamed Zenit Arena. They traced all spending since 2006 and came up with a disturbing difference between official budget and actual spending. After numerous inflations, Zenit Arena is now officially worth RUB 42.8 billion ($720m). However, according to data available in the St. Petersburg Construction Committee real spending is now in excess of RUB 48 billion ($808m). How did they come up with the massive $88-million discrepancy? As it turns out, significant part of the contracted works was paid for twice. First to the former contractor Transstroi and then to the current one, Metrostroi. Transstroi were sacked in mid-2016 and haven’t met all contractual obligations, forcing authorities to pay another company for an already financed portion of the stadium as well. St. Petersburg and Transstroi are now fighting in court. Local authorities are hoping to recoup the mentioned amount but Transstroi return the favour, blaming the investor for the loss of 4.9 billion. 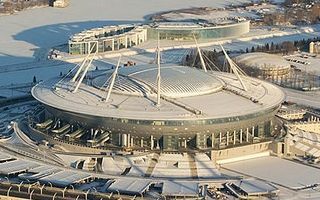 The final cost of Zenit Arena will thus be known only after the conflict is over but actual spending is now almost 8 times higher than the original budget from 2006 (back then 6.4 billion)! Zenit Arena will host the 2017 Confederations Cup and the 2018 World Cup, later followed by Euro 2020. It’s the world’s largest stadium to have both a retractable roof and field sliding outside with over 68,000 seats.